WASHINGTON --- On April 4, 2008, the Defense Security Cooperation Agency notified Congress of a possible Foreign Military Sale to Turkey of MK 41 Vertical Launch Systems as well as associated equipment and services. The total value, if all options are exercised, could be as high as $227 million. The Government of Turkey has requested a possible sale of six MK 41 Vertical Launch System (VLS) Baseline VII tactical modules and two sets of MK 41 VLS upgrade kits to modernize two MEKO Track IIA frigates, four ex-Perry Class FFG Frigates and to upgrade two MEKO Track IIB MK-41 VLS from baseline IV to baseline VII configuration. Included with the MK 41 VLS are the ship’s fire control system upgrades to allow for Evolved Sea Sparrow Missile capability, installation and testing, U.S. Government and contractor engineering and logistics personnel services, equipment operation and maintenance, personnel training and training equipment, support and test equipment, spare and repair parts, publications and technical documentation, launch system software development and maintenance and other related elements of logistics support. The estimated cost is $227 million. The proposed sale of Vertical Launch Systems to Turkey will contribute to U.S. security objectives by improving the Turkish Navy’s ability to contribute to coalition and NATO operations and the Global War on Terrorism, and coalition operations such as United Nations Interim Force in Lebanon and BLACKSEAFOR in the Black Sea and Eastern Mediterranean regions. The proven reliability and compatibility of like systems in association with numerous platforms will foster increased interoperability with U.S., NATO and coalition forces, and expand regional defenses to counter common threats to border and shipping assets in the region. The Turkish Navy can easily integrate this system capability into its concept of operations and will have no difficulty absorbing these systems into its armed forces. The principal contractor will be Lockheed Martin Maritime Systems and Sensors of Baltimore, Maryland, and Moorestown, New Jersey. There are no known offset agreements proposed in connection with this potential sale. Implementation of this proposed sale will not require the assignment of any additional U.S. Government representatives or contractor representatives to Turkey. Ficaria por quanto cada sistema??? ?se fossem só 6 sistemas seria ~37.8 M por sistema, portanto seria menos...uns 30-35 M por unidade??? Não leves isto como um ataque pessoal, porque não o é. A Turqiua tem: A Grécia, o Bósforo, o PKK, a Ucrania/Russia, pena de morte. Não tem O PSD, PCP/ Os Verdes a Quercus, o PS, O Mário Soares. E por ultimo, espero que a minha resposta não volte a ser apagada "por engano". porque é que haveria de levar a mal? Mas nós temos os Pérfidos Castelhanos :! : ...e os Mouros de marrocos, carago! Creio que os turcos, prevêem combates a distâncias relativamente curtas próximos à costa. Acredito que, por essa razão eles não utilizam radares e sistemas de controlo de tiro mais eficientes. Uma fragata da classe Barbaros (e não devemos esquecer que a Turquia já tem duas fragatas MEKO equipadas com o lançador MK-41) não me parece ter uma capacidade militar muito superior a uma fragata Karel Doorman. Pelo menos tendo em consideração os equipamentos que oficialmente sabemos que elas transportam. Em principio a principal diferença, será a capacidade para disparar contra mísseis anti-navio que o ESSM tem relativamente ao Sea-Sparrow. E essa capacidade, está disponível nas futuras fragatas Bartolomeu Dias. A questão é se em águas oceânicas, existe alguma vantagem nisso. O problema continua sempre a ser o controlo dos mísseis e a quantidade de mísseis que podem ser lançados (e controlados) simultaneamente. The navy's two warships are about to get sharper teeth to fight off attacks by small surface craft. The Phalanx quick-fire Gatling gun on the Anzac frigates, HMNZS Te Kaha and HMNZS Te Mana, can fire up to 4500 rounds of 20mm ammunition a minute but only at anti-ship missiles and strike aircraft and not at small boats. The navy is spending $25 million to upgrade the computer-controlled, radar-guided guns so they can also fire at small craft, such as speed boats or jetskis which may come in fast to attack the ships. "If you have got a guy coming on a jetski or the like, wishing to do some damage to the ship, the Phalanx can be used to account for that," said navy spokesman Commander Keith Gilchrist. He said the age of the existing Phalanx guns on the frigates was also a factor and meant they "might be challenged a little bit" against some of the high-performance airborne threats it could face. 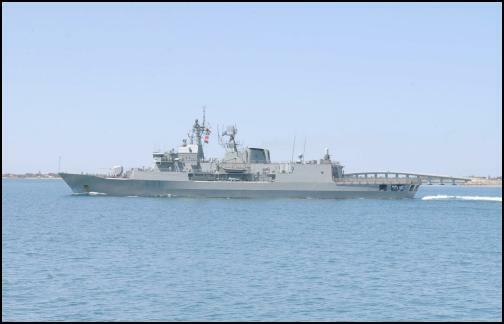 The navy is also gearing up to spend up to $500 million or more on upgrading the self-defence systems on the two frigates and a further $60 million on a platform systems upgrade as part of the mid life upgrades of the two ships. The platform systems upgrade, which does not include the combat systems on the ship, was likely to begin next year and be completed in 2010. It could include propulsion equipment such as gearboxes and engines, air conditioning units, generating equipment, main machinery control equipment and computers which monitor the ship and its main components. The self-defence upgrade was likely to start in four or five years and included a wide range of combat systems on the two frigates. "The self-defence upgrade is about upgrading the self-defence system and the sensing systems on the ship to enable it to go into areas against a threat that has perhaps changed from when the ships were originally conceived and built. "We are not aiming to do anything different from what the ships can do already. We are looking to retain a similar mix of weapons and sensors but the sensors will be 21st century sensors rather than 1990 sensors which we acquired when the ship was built." He said the systems would also be enhanced to deal with different threats the ships were likely to now encounter. "As technology changes everyone moves up a gear and therefore, the level of threat the ships might encounter is different to what it was." In the long term development plan, the Defence Force said the frigates were critical in the protection of New Zealand and Australian territorial sovereignty, for participating in Five Power Defence Arrangements, for supporting New Zealand's relationships with regional partners, and for peace support operations in the Asia Pacific region and beyond. Those environments contained significantly higher threats to ships than in New Zealand's immediate area, including sub-surface threats. The plan said by 2010 the frigate's self-defence systems would become increasingly ineffective and to continue to operate in those areas would carry serious risks. Within two years the design of the self-defence systems on the frigates would be nearly 25 years old, and would become increasingly difficult and expensive to support, the plan said. - e a substituição do sistemas CWIS e Goalkeeper, pelo sistema RAM, que é sistema anti-missil mais moderno. ARSENAL DO ALFEITE REFORÇA CAPACIDADE DE INTERVENÇÃO NAS FRAGATAS "VASCO DA GAMA"
l Na sequência do projecto de modernização do sistema Phalanx, nos três navios da classe “Vasco da Gama” para a versão “Block 1B”, realizou-se no passado mês de Janeiro, a recertificação da IMA – (“Intermediate Maintenance Activities”) sediada no Arsenal do Alfeite. A Direcção de Navios, como entidade responsável pela configuração do Sistema Phalanx, integrou no processo de modernização a recertificação da IMA, garantindo a continuidade da capacidade de manutenção, por parte do Arsenal do Alfeite. A certificação de competências e das instalações visa sobretudo garantir uma resposta eficiente na manutenção do Phalanx, maximizando o tempo de operacionalidade dos sistemas. Esta acção criou condições para que a equipa técnica do Arsenal do Alfeite ficasse habilitada a efectuar o mesmo tipo de intervenção, nos sistemas instalados nos navios da NATO, sempre que estes o requeiram. A recertificação realizou-se no período de 7 a 18 de Janeiro de 2008, na Divisão de Armamento do Arsenal do Alfeite, teve a participação, dos elementos da secção de Sistemas de Defesa Próxima (CIWS), e do pessoal técnico das guarnições dos três navios da classe “Vasco da Gama”. "In completing this testing CEA has taken a significant step towards finalising the evolution of its fourth generation digital active array radar. This development commenced following trials onboard HMAS ARUNTA in 2004. The first two deliverable systems are currently in production at CEA’s facilities and are due for delivery in December 2009, with system level grooming and integration commencing in 2008." "The expected delivery date for the first of class is june 2011"
Desculpe a incúria, mas o ceafar é um radar de auto defesa? CEAFAR Radar is a fixed, active phased-array 3D radar incorporating latest technologies to provide unrivalled performance, at a price that is competitive with modern 2D radars. The CEAFAR system is available in a number of configurations to meet operational, physical and budgetary requirements. CEAFAR is suitable for use in a range of military and civil applications including ship self defence, ground surveillance radar (GSR) and air traffic control. The CEAFAR system is fully coherent, modular, programmable and scaleable, with the smallest configuration being man portable and the largest suitable for shipboard or fixed-site applications. The CEAFAR antenna array is a static, modular active antenna that uses discrete antenna tiles as the basic building block. Tiles are nominally available as an 8x8 array to provide full 3D capability. Optionally, a 32x2 array is available for high resolution 2D requirements such as man-portable GSR or coastal surveillance systems. O CEAFAR é um radar estático tridimensional. Ainda a respeito do CEAFAR, já há muito tempo que acho que esta é a resposta mais acertada tecnicamente para o MLU das VdG e para a aquisição a um preço relativamente baixo de uma capacidade de defesa de área. - 2 submarinos da classe "Tridente" com Sub-Harpoon além de torpedos. - 2 Fragatas Bartolomeu Dias modernizadas para luta ASW, com sonar rebocado activo de muito baixa frequência e 32 mísseis ESSM nos lançadores MK48 ao invés de 16 NATO Seasparrow, juntamente com os respectivos radares de tiro modernizados e um helicóptero FutureLynx ou NH-90. - 3 Fragatas Vasco da Gama modernizadas e adaptadas para luta AAW equipadas com CEAFAR, 32 mísseis ESSM montados num lançador óctuplo MK41 de auto-defesa na vante (sempre estiveram preparadas para tal), 16 mísseis SM-2 em dois lançadores óctuplos MK41 montados no lugar do lançador MK29 de NATO Seasparrow e um helicóptero FutureLynx ou NH-90. Ainda haverá combustível para as manter no mar em 2018? Talvez vá perguntar o obvio... mas o CEAFAR substitui qual radar na VdG, o DA08 (e STIR 180 no lançamento de ESSM)...? E substituir aqui implica remover fisicamente?